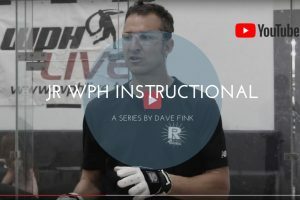 WPH Press, Tucson AZ – Take your handball game to the next level with the five – part JR WPH Instructional Series aimed at teaching the proper techniques and fundamentals to executing the game’s most important shots. The five-part JR WPH Instructional Series will guide you in self-play drills to quickly take your game to the next level, focusing on tactics and drills to develop a devastating Power Serve, a rally-ending Back Wall Kill, and a first-strike Fly Kill. Also included in the five-part JR WPH Instructional Series is the JR WPH Warm-up to prevent injuries and to enable you to be ready to play your best handball from the first ball to the last. Want to learn some of this Handball Terminology from the pros?